My name is Elizabeth Trenka. Not Betty, thank you very much, although Betty is what I’ve always been called for the past sixty plus years. I think I mentioned somewhere back at the beginning of my career as a mystery character that I’ve put up with it because it’s wasted energy to try to change people. I suspect that Betty is a comfortable nickname, especially to the self-important business executives I’ve had to deal with. They don’t know quite what to make of a rather tall, somewhat formidable woman. Oh yes, I was formidable even when I was just a young thing starting out in the business world, and now that I’m a senior, I guess I terrify them. The no-nonsense approach to life and business that I’ve developed over the years has stood me in good stead, but young guys in nice gray business suits and ties picked out by the “little woman” tend to be intimidated by me, so I’m called Betty almost immediately. Makes them feel more in command. Just my theory, of course, and real gentlemen, like my neighbor Ted Kelso, are punctilious about using my proper name, Elizabeth. I came into existence when my author, Joyce Christmas, was offered the opportunity to create a second series to alternate with her original character, Lady Margaret Priam. 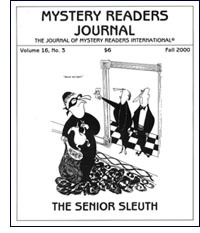 At the time (1993), there weren’t too many senior sleuths in the mystery world. Mrs. Pollifax was in business, of course, Miss Marple had been around forever, and Jessica Fletcher was setting a standard for TV viewers, although I can’t say I could equal her wardrobe—I’ve never been inclined to worry much about my clothes, although I always tried to look neat and professional. There were a few older sleuths back then, but not many, so writing an older character seemed like a fresh new idea. At the time, I was delighted to start a new career in the pages of a book—I’d just been forced to retire from my job as office manager at a company where I’d worked for more than thirty years, and I was feeling useless and at loose ends. My job had been my life and I needed to have tasks to give my existence a purpose and a shape. I confess that I am totally undomesticated, so a little amateur crime solving in lieu of puttering around my little house in Connecticut seemed to fit the bill. I don’t feel sorry for myself, and I’m not lonely, even though friends in my village of East Moulton keep urging me to take in a boarder or get a pet to keep me company. I find I’m pretty good company for myself, and I don’t want anybody around making demands on me. That being said, I did inadvertently acquire a somewhat disagreeable cat that had belonged to a childhood friend. When I think of my friend, I realize how fortunate I am. She’d been a world-famous model who got too old for her profession. I may not have my old job, but I never experienced a decline from a peak of fame and adulation like poor Viola because nobody wanted to look at an old face in a designer dress. I’m not too old for anything, as long as my arthritis doesn’t flare up. I never was a beauty, so there’s nothing to lose in that respect, and I still have a future. My author was especially interested in creating a senior sleuth, not only because she’s not getting any younger herself, but also because over the years she developed close friendships with people much older than she and she wanted to explore some of the difficulties and pleasures of the senior world. It seemed to my author that a senior with wide experience in the business world would have a wealth of practical knowledge and an understanding of people that would make it easier for to figure out motives for murder. And in the end, an older person, a woman especially, is someone people of any age are willing to confide in, even kids who think “older” means kind of out of it. Now that I’m retired, and comfortable financially (my old boss Sid Edwards saw to that when he too was forced to retire by his conniving son), I find I have the time to think about doing things I couldn’t do when I was younger and had a lot of responsibilities. I’m looking forward to traveling, or taking some courses at a local college. I like to keep busy, so I take temporary jobs when they turn up. I’ve been a temp at a small local company, and a fill-in school secretary. I’ve helped with the preparation of the memoirs of a man famous (at least) in his own mind. I helped a young woman write her résumé so she could exchange small-town life for the excitement of the big city, but did persuade her that corporate vice president was not an entry-level position. I even went back to my old company to help clear out the boss’s files when he had a stroke. That was painful because Sid had been the love of my life, and now in my twilight years, he still is, even lying speechless in a nursing home. Well, that’s the way it is when the years start creeping up on you. There’s always the threat of illness, of being alone, feeling useless—unless you make an effort to seize the life that’s left to you and fill it up. Not many people get to fill it up with unraveling murderous deeds, but I think a senior sleuth is able to face mortality calmly and bring the wisdom of her years to bear on a puzzle or on the devious thinking that leads to crime. I’ve even learned a thing or two I never expected. For example, I never thought I knew anything about children, but when Tommy, the boy who mows my lawn, was having problems, I surprised myself by understanding what was wrong, and saved him from making a tragic mistake. I’m enjoying my second “career,” even though I don’t earn anything from it except personal satisfaction. I haven’t quite established a totally comfortable framework for my life, but I keep working at it. There’s so much to see and do in today’s world. I’m learning about the Internet, and making some new friends. This fall, in a new book called A Better Class of Murder (Ballantine, Nov 2000), my author gives me the opportunity to meet Lady Margaret Priam, her other series character, and mix with Margaret’s New York society friends. They’re an odd crowd to say the least, but I found Margaret charming, and very satisfying to work with in figuring out a little problem. We’ve even talked about going to England together for her brother’s wedding. I never dreamed that I, the offspring of first generation Czech blue-collar parents, would find myself hobnobbing with English aristocrats and dancing at the wedding of an earl! My author thinks that writing a senior sleuth is more challenging than writing about an expatriate British aristocrat in New York because it’s a silly sort of existence at best, while I’m facing the real problems of aging and finding a fulfilling life. My author claims that by writing my tales, she’s practicing to be my age. The people who read and enjoy my adventures seem, many of them, to be middle-aged or older, and they’ve often said that they can identify with me. I hope I’m reminding them of ways to grow old gracefully, of the possibilities that lie ahead whatever their age, even if they don’t get to stumble over a body under the azalea bush from time to time. Joyce Christmas’s web site is www.joycechristmas.com. People make choices; it’s the human thing to do. We choose a job or profession, a place to live, a life’s mate (or not), a name for the baby. We decide what book to read or write next, what to do about or to an obnoxious neighbor. More often than not, I believe, these choices strike the chooser with a grand “Aha!” but are, in fact, the result of a lot of subterranean, back-of-the-brain activity he/she has failed to notice. Some time ago I cheerfully chose, or thought I chose, to become a writer of mystery novels. In the series that followed this choice, I wrote of crimes, including murder, committed in a small town called Port Silva and solved by members of that town’s police force. Although these policemen and women have lovers, spouses, and families, they wear uniforms and work on schedules and are bound by not only by laws, but by jurisdiction, hierarchy, rules. My Port Silva novels are not exactly police procedurals, but the people, like their creator, are certainly bound by procedure. The idea stuck in my mind like a brief musical phrase that keeps repeating: “Amazing grace, how sweet the sound,” or “Tis the gift to be simple…” I was going to have to go with it, couldn’t escape it. It would involve a grown daughter, of course, and not a dewy-eyed innocent, either; and the mother would therefore be an older woman. I had clearly tipped myself right into the “senior sleuth” arena. Here’s where the background information-accumulation kicked in. I am in fact the mother of a grown daughter—two of them, in fact—and thus have become, willy-nilly, an older woman. In the process of reaching these states, I had acquired a wealth of ordinary and arcane knowledge pretty much the way a table acquires nicks and scrapes: by simply standing there doing my job. For instance. Children are visible, in a generalized, as-a-class way. Young women who are healthy and even moderately attractive are very visible. The woman advancing through the middle years, however, acquires not only gray hair and the occasional wrinkle or joint-twinge, but an increasing transparency. But here’s the reward. If this nearly-invisible woman displays a modest smile and a soft voice, people will let her talk to their children; will reveal family secrets while sharing a bus seat or a park bench; will take the chain off the door and invite her inside out of the cold rain. Given the pluses, it seems to me that a woman from, say, mid-fifties to mid-seventies, if she is ambulatory, mentally agile, and deeply, even invasively curious, is ideally suited to being either a detective or a con artist. So I created a woman like that, for a story. And how much of her is me? You never know. Patience is a small woman, with curly gray hair and what she mourns, when she thinks about it, as a vanishing waistline. She was always too busy to notice food fads, has never been near a gym. She gave up cigarettes long ago, but practices her own version of moderation with single-malt Scotch and California (usually) wines. A good shot who regularly takes target practice, she has a permit to carry her handgun but rarely does so and has never had to fire it at a person. At story time, Patience has lived for almost five years in the former Mackellar vacation home, a cottage on a large lot on the outskirts of Port Silva. There she enjoys independence, solitude, and the company of a small rescued terrier named Ralph. For society she has Friends of the Library, the Choral Society, and Captain Hank Svoboda of the Port Silva police, a long-time friend. Into this well-ordered world comes the second half of the team: Patience’s thirty-year-old daughter, Verity, who is on the run from an unhappy marriage and a powersuit-and-briefcase job in San Francisco. Tall and lean, a runner, Verity has an MBA from Stanford and the kind of high-headed, free-striding personality that can raise eyebrows or even hackles. Verity, Patience acknowledges to herself with a quiet sigh, was never a comfortable person to have around; Patience loves her, but hadn’t planned on living with her. Verity’s energy and intelligence, however, demand employment, not for money but for recovery, for survival. So here’s another “found” or learned gift to the maker of stories: the natural tension of changing relationships as mother and daughter try to become just two adults with lots of history who will work together and complement each other on behalf of anxious, frightened, or sometimes dishonest clients. And after all, Patience is getting a bit old for leg-work. Keepers, the first novel to feature the Mackellar women, will be published by Perseverance Press/John Daniel & Co. in the fall of 200l. Patience and Verity are currently detecting privately in a short story on Janet LaPierre’s web page, www.janetlapierre.com.